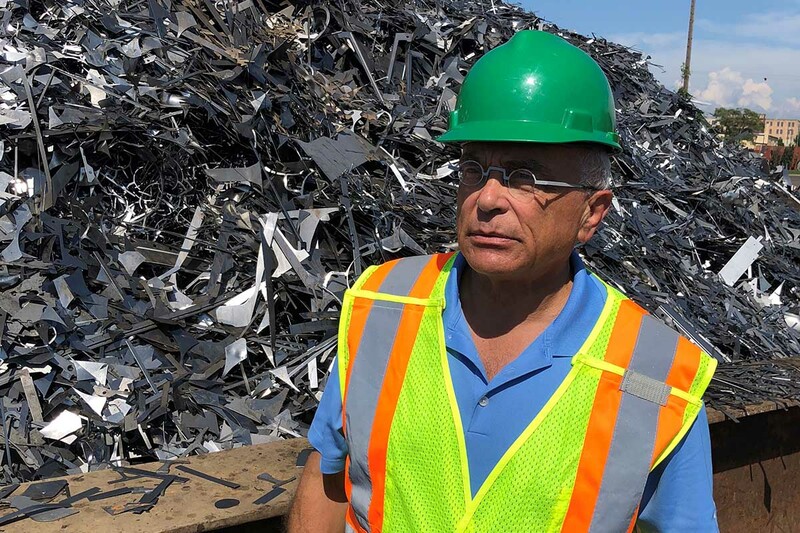 In Holland, materials recycler Padnos was among the first Michigan businesses to feel the blow of a brewing international trade war. Striking back against U.S. tariffs on Chinese steel and aluminum, China in April slapped a 25 percent import duty on U.S. scrap aluminum sent to China . That was a punch to the gut for the firm, which employs about 600 workers in 19 Michigan locations. Padnos said that meant the loss of nearly 2,000 tons a month in exports - virtually all the company’s exports - losses the firm is scrambling to make up. The firm’s refrain is echoing among business big and small across Michigan. A firm north of Grand Rapids that makes special cutting tools for the lumber industry worried earlier this year that import steel tariffs could put it out of business. A metro Detroit auto parts firm battled for months to stop a tariff it feared would do the same. While a farmer north of Lansing frets that falling soybean prices threaten his livelihood. Perhaps more ominously, stock shares of Michigan’s Big 3 automakers plummeted Wednesday as each issued downward revisions on profits because of rising commodity costs tied to steel and aluminum tariffs imposed by the Trump administration. Net income at Ford Motor Company fell by $1.1 billion for the second quarter compared to the same period a year ago. In June, the European Union tagged $7 billion in U.S. exports with tariffs that included more than $800 million in goods from Michigan, according to Business Insider, a financial news website. The bulk of that stems from a 25-percent tariff on $674 million in rearview mirrors set to take effect in 2021, a tax that would hit one West Michigan business hard. Zeeland-based Gentex dominates the global market for auto-dimming rearview mirrors, sending nearly half its production to Europe in 2016. Company officials no doubt are hoping the trade war will be over before they are hit. The firm did not respond to multiple requests for comment. Following a wave of import tariffs levied by President Trump, the U.S. is now embroiled in trade wars with Canada, Europe and Mexico, as well as China – and Michigan is caught squarely in the middle. All told, these long-time foreign trading partners have retaliated against Trump’s 25 percent tariffs on steel and 10 percent on aluminum with tariffs of their own as high as 50 percent on an estimated $3 billion in Michigan exports. That’s everything from soybeans and pork to cars and industrial and automotive parts. Tensions eased a bit on one front Wednesday, as Trump and EU Commission President Jean-Claude Juncker agreed to new talks aimed at eliminating tariffs between the United States and Europe and to hold off - for now - additional tariffs. But their conciliatory tone did not alter tariffs already in place as negotiations continue. Canada – Our northern neighbors hit the U.S. July 1 with tariffs on $12.8 billion in U.S. goods, including an estimated $1.2 billion on Michigan exports, according to analysis by Business Insider. Michigan is behind only Ohio, which has $1.8 billion in goods that could fall under Canada’s tariffs. The tariff list includes 25 percent duties on dozens of steel products and 10 percent tariffs on aluminum as well as a variety of household appliances. European Union – The EU imposed $3.2 billion in tariffs on a wide range of U.S. imports, with another $4.3 billion to take effect in 2021 if the trade dispute is not solved. Michigan is again second-hardest hit, behind New York, with $825 million of goods subject to tariffs. China – On July 6, China imposed $34 billion in tariffs on U.S. goods including crude oil, small-engine vehicles and various agricultural commodities. Michigan has approximately $970 million in goods subject to higher tariffs, 11th highest in the nation in potential impact, according to Business Insider. Mexico – In June, Mexico levied tariffs of 15 to 25 percent on steel and farm products including pork, cheese, apples and potatoes. Experts say Michigan is particularly vulnerable to shifts in international trade for one simple reason: Trade is the backbone of the state economy. International trade comprised $200 billion of total state GDP of $514 billion in 2017 – at 38.9 percent, a greater share than any other state. Michigan did about $72 billion in trade with Canada in 2017, followed by $65 billion with Mexico, by far Michigan’s biggest trading partners. And while Trump tweets that “trade wars are good and easy to win,” economists are skeptical. “I don’t think anybody has ever won a trade war,” said Michigan State University economist Charles Ballard. “Something that keeps economists up at night is what happened in 1930, when the U.S. passed the Smoot-Hawley tariffs, the largest tariffs in American history. You know the rhetoric, ‘This is going to save American jobs,’” Ballard said. Within days, Ballard said, other nations responded with tariffs of their own. “International trade basically collapsed and that contributed to the severity of the Great Depression,” Ballard said. Nonetheless, Trump supporters like Debra Mantey-Ell, a Michigan Trump delegate to the 2016 GOP national convention, credit the president with holding firm where previous presidents failed. She said she believes his tough stance will ultimately pay off for American workers. “It’s pretty simple,” the Frankenmuth resident said in an email to Bridge. She added: “Our president recognizes what other weaker American leaders forgot: America has enormous leverage on the world economic stage. And it’s time to use it. In the meantime, the state agricultural industry looks to be in the crosshairs of this fight, as China taxes U.S. commodities including soybeans, corn, pork, beef, cherries and dairy products, as well as cars and gearboxes. That was payback for tariffs on $34 billion in Chinese exports that kicked in the day before. North of Lansing, Dave Williams farms about 3,800 acres of soybeans. He’s watched the price of soybeans plunge about $2 a bushel from about $10.50 a bushel to $8.50 a bushel since China first threatened in April to hit U.S. agriculture, as the looming trade war ratcheted up. “If this goes on much longer, it will take a big bite out of agriculture. I’m a fifth-generation farmer and I sure don’t want to see this go down the tubes,” said Williams, who is also president of the Michigan Soybean Association. According to the MSA, soybean production contributes $1.87 billion to the state economy as well as 14,000 jobs. The state exported $564.3 million in soybeans in 2016. Michigan exported nearly $2.7 billion in food and agricultural products in 2016, U.S. Department of Agriculture data show, with Canada, China and Mexico its biggest trading partners. Earlier this month, Williams attended a meeting of the American Soybean Association in Washington D.C., where members gave members of Congress an earful. He said they were told they’d already passed along their to the White House. “It appears to be falling on deaf ears,” Williams said. John Kran, national legislative counsel with the Michigan Farm Bureau, noted that national farm income has dropped by 50 percent over the last four years because of falling commodity prices. The tariffs could hit Michigan cherry growers as well. Michigan exported more than $30 million in tart cherry products in 2016, up 64 percent since 2007, according to the Cherry Marketing Institute in DeWitt. As fears grow over the impact of the president’s trade war on agriculture, the Trump administration on Tuesday announced $12 billion in emergency relief to farmers hurt by it. And while Trump promises to revive the U.S. steel industry – asserting it is already “through the roof” because of his actions – one Michigan firm says that steel tariffs can cut both ways. In Big Rapids north of Grand Rapids, Simonds International manufactures specialized cutting blades for the lumber industry. Company officials said earlier this year the high-grade steel it needs is only made in Europe or China. McGee said then a steel tariff would raise its costs, giving Simonds' foreign competitors a big advantage. "This plant could shut down. And all 80 employees here — a lot of very good people — could all lose their jobs." And if this trade war escalates, industry analysts say, it could weigh down the automotive industry by raising prices and dampening consumer demand. Trump – after first posing a 25 percent tariff on all foreign auto imports - is now threatening a 20 percent tariff on EU auto imports, a move industry advocates warn could boomerang on the U.S. auto sector even as it bolsters the domestic steel industry. In Michigan – with an auto sector that produces about $40 billion a year and employs about 190,000 workers – that’s no small consideration. According to American Iron and Steel Institute, the steel industry employs about 23,000 workers in Michigan. Harrison pointed to a steel plant in Illinois that planned to add 800 workers, in large part because of Trump’s steel import tariffs. She was unaware of any Michigan plant that planned to add jobs. But automakers say the steel tariffs could add $300 to the cost of a car by driving up the global price of steel. That could force auto firms to either raise the retail price or absorb their higher cost. The Peterson Institute for International Economics, a pro-global trade Washington D.C. think tank, calculated that a 25 percent tariff on auto imports would cost nearly 200,000 U.S. auto jobs over a one- to three-year period. One metro Detroit auto parts firm – faced with being driven out of business by a tariff on parts it makes in China – fought a months-long campaign to get those parts removed from the administration’s prospective tariff list. Mary Buchzeiger, CEO of Auburn Hills automotive hinge manufacturer Lucerne International, told Crain’s Business Detroit she turned her conference room into a “war room,” as the firm contacted representatives, senators, consulted attorneys and hired a public relations firm. The firm ultimately prevailed, as the parts were dropped from the list. "The execution our administration is taking (on trade), for lack of a better word, is asinine," Buchzeiger told Crain’s. "It's destroying U.S. companies left and right." Trump is now threatening China with tariffs on all $500 billion it exports, as China has vowed to retaliate should the United States do so. He continues to talk about tearing up the North American Free Trade Agreement between Canada and Mexico. Jim Robey, an economist at the W.E. Upjohn Institute for Employment Research in Kalamazoo said it’s hard to predict how all this might play out for Michigan. But Robey said the potential for chaos is likely to prompt businesses to put investments on pause while they await more certainly in the marketplace. Robey said it’s hard to plumb Trump’s ultimate game plan. The best-case scenario – a high-stakes bluff that pays off with better trade deals. Business owners and farmers deserve sympathy - unless they voted for Trump. During the campaign, Donald constantly spoke of using tariffs to attack other countries, derail TPP, and get out of NAFTA. He shouted it at every rally. Businesspeople and farmers voted for tariffs when they voted for him. It's no excuse if the assumed he was lying about tariffs because, well, he lied all the time. And if they couldn't hear him declaring his intent to use tariffs, it was because they were too busy yelling "Lock her up". I hope them farmers love their new masters the russian owner of their farms as much as they still love tRUMP!!!! So we either go on ad infinitum getting the losing end of trade deals, or we make changes. I guess it is better for some agendas (liberal Bridge pundits) to put all the temporary bad news in the headlines of the story, and bury the good news in the last paragraph that yes, maybe we will come out of all this with better deals. Just this week, our President Trump held a press conference with the EU head on some trade deals they had just renegotiated. They continue to negotiate and the desire on both sides is to eliminate the tariffs, opening up more markets for Michigan products. At the top of the list was soybeans, and the President even quipped "time for the EU to order a lot of soybeans". So if you want to keep getting punched in the gut forever, continue without doing anything. If you want better deals, negotiate new ones. I really like what the President is doing right now to make life better for Americans. There are other ways of negotiating better trade deals. Tariffs and blackmailing other countries will simply not work. Crying out like a victim will not solve anything. Joining up with your allies to pressure China would have been a smart move, but then you elected a 'bully' for President who wants to be the savior for what? Yes. Bullying and blackmailing does not work, never will. Sadly, Trump and his fellow grifters have poisoned the well and it's clear to the EU, China, Canada, Mexico, etc. will no longer trust ANYTHING the US says. Trump spelled out his policy on trade and tariffs very clearly during the campaign, yet farmers voted for him overwhelmingly. Why are they now surprised that he is implementing those policies? So while 45 is bullying his way around the world trying to rewrite trade deals other countries led by China are busy forming their own trading partnerships w/o the US. I'm not a trade or finance expert but this doesn't seem to bode well for the US. It's really a zero sum game- basically a problem of the fat lady with a short skirt; she pulls it down in one place and something pops out somewhere else. The Chinese will buy their soybeans from Brazil and the Japanese and Italians who have been taking the Brazilian product will be short and will seek soybeans from the available source, the US midwest. Sure, a kind of shell game but with no one a loser. Whoever told you that never studied macroeconomics or marketing in school. There are hundreds of examples where consumers and markets choose alternative goods in rising prices. There may not be a 1:1 loss for US farmers as a result of Chinese tariffs, but there will be substantial and punishing consequences. Recommend each Governor candidate state their position to Trump's tariff and voter concerns. You reap what you sew! As someone favoring individual choice and opposed to governmental control and protectionism in almost every circumstance, it is breath taking watching the usual leftists and Neo-Marxists struggle with how to handle Trump's recent actions favoring their love of government action verses their visceral hatred of the man. Now if it was Bernie doing the same thing .... it would be a different story.